Read Aloud 15 Minutes has launched their October “Let’s Talk: Harvest” campaign, reminding parents that the more one sows, the greater the harvest! Babies begin learning at birth, and the campaign emphasizes the fact that great things come from small beginnings. Read Aloud 15 Minutes is a national non-profit organization that is working to make reading aloud every day for at least 15 minutes the new standard in child care. When every child is read aloud to for 15 minutes every day from birth, more children will be ready to learn when they enter kindergarten, more children will have the literacy skills needed to succeed in school, and more children will be prepared for a productive and meaningful life after school. Just 15 minutes a day of reading aloud from birth is more than 450 hours of reading time by kindergarten. 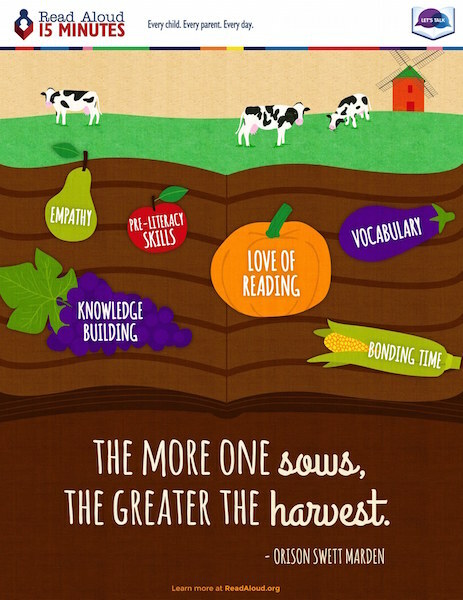 Visit www.readaloud.org for a variety of resources and tips for reading aloud, including a “Let’s Talk: Harvest” toolkit. If you’re interested in reading to children in Durham as part of our Readers as Leaders program, please contact Davida Major, Operations & Volunteer Coordinator at the Partnership.